Welcome to Newfoundland :: Travel & Stay :: Where To Stay? Quirpon Lighthouse Inn, Quirpon Island. No matter what kind of accommodation you’re looking for – a hotel, motel, inn, bed and breakfast, guesthouse, or hospitality home – these accommodations are sufficiently available all around Newfoundland. Some will be open all year around, others will welcome you in the summer season only. Reservations are not necessary, but wise in July and August. Most accommodations accept major credit cards. Some smaller bed-and-breakfasts or guesthouses may want cash. For those who are looking for self-catering accommodation, at a lot of places in Newfoundland there are cabins or cottages for rent. Newfoundland also has excellent camping facilities. A great variety of parks and camping grounds are available for those who are travelling with a tent, trailer or motorhome. Camping in the wild is allowed all over Newfoundland, except for the National and Provincial Parks, where you have to stay on the official camp grounds. A good website for searching your accommodation is: Newfoundland and Labrador Tourism: Where To Stay. Tip: For visitors of the Bonavista Peninsula the Artisan Inn in Trinity offers excellent accommodation. During our journeys to Newfoundland we spent the night in all different kind of ways. We have been travelling around with a small light-weight hiking tent, we have been guest in hospitality homes and guesthouses, and have slept in hotels and inns. One time we hired a "cabin by the sea" in winter time and stayed with friends in Twillingate. But what we really like most, is travelling around by camper or motorhome. In that way we have found marvelous places for an overnight stay, usually with an ocean view. Very special, and maybe therefore our most beloved accommodation, is Quirpon Lighthouse Inn. To get there one have to drive to the most northerly point of The Northern Peninsula rijden, but it is worth the long drive more than that. Quirpon Lighthouse Inn is located in a 1922 lightkeeper's home on the shores of Quirpon (pronounced like harpoon) Island. 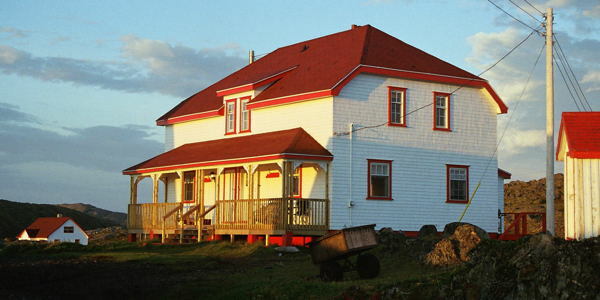 Fully restored in 1998 by Linkum Tours, Quirpon Lighthouse Inn now features a number of guest rooms in Victorian style. Included in the price for a room are all meals and transportation by boat to and from the island. 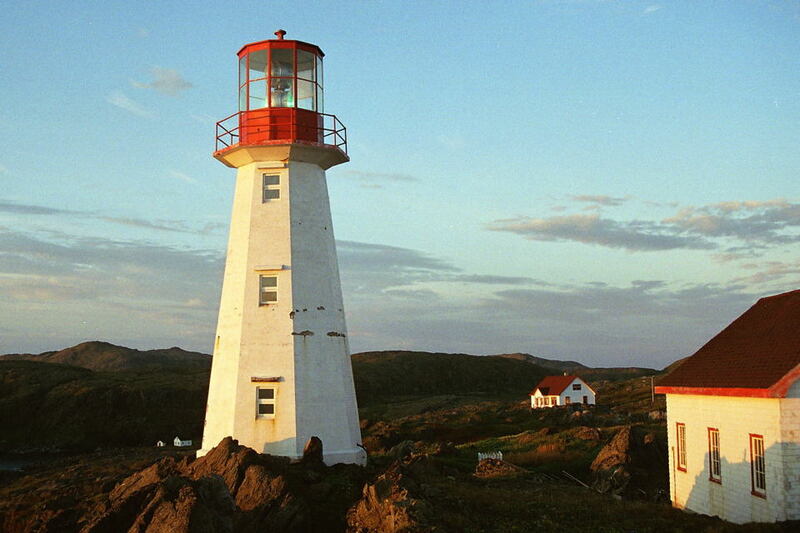 What makes an overnight stay in Quirpon Lighthouse Inn so special? First and foremost there are the very friendly and hospitable Nelson and Dorus. In a 45 minute boat tour Captain Nelson will take you to and from the island. From the dock it is a 15 minute walk to the inn, where Doris is preparing her delicious homemade traditional supper. And for the rest it is the whole setting which makes this place so particular. You're staying on a deserted island and your only neighbours are dolphins, orca's and whales migrating along the shore. Are you interested? Go to the website of Linkum Tours for further information or bookings.